Posted on July 22, 2015 by Dayna B. 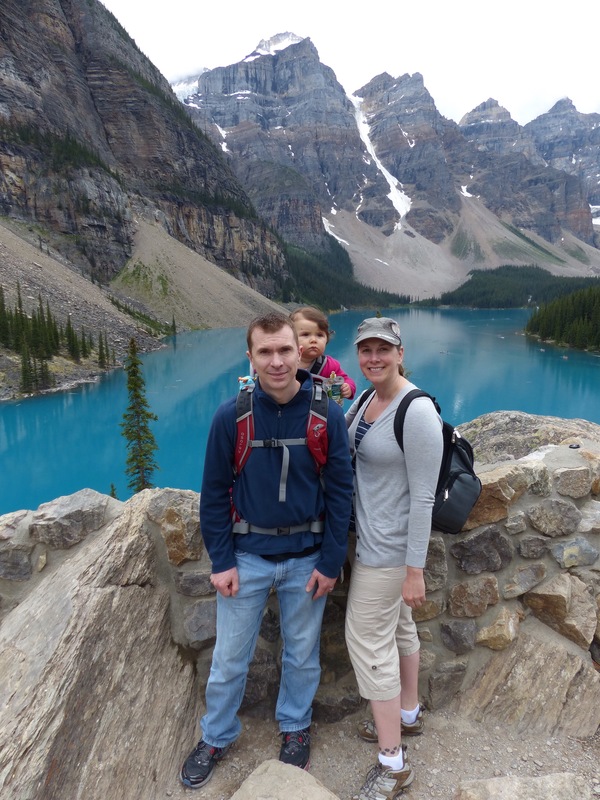 When visiting lakes in Banff National Park, people typically think about Lake Louise. 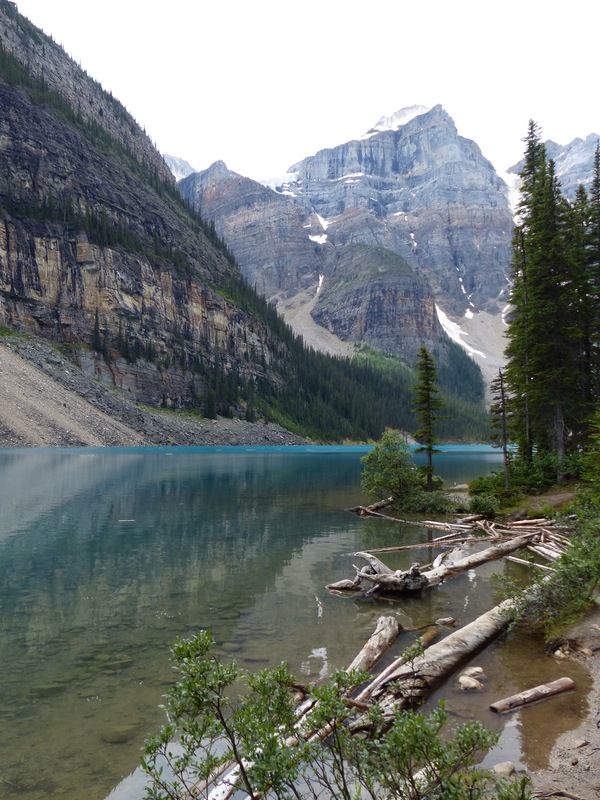 It’s almost as if Moraine Lake is the younger, overlooked sister to the prom queen, Lake Louise. 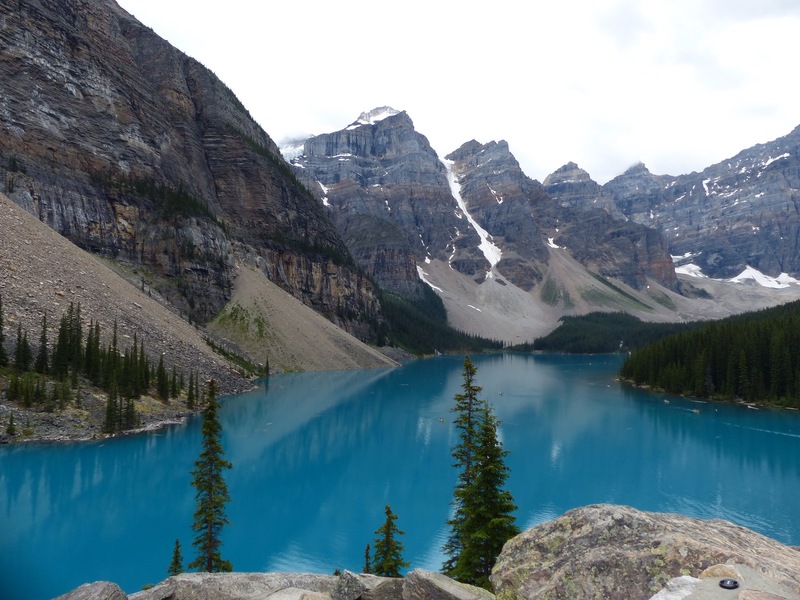 Before arriving in Banff, I had never even heard of Moraine Lake, but I am so glad that I didn’t leave without seeing it! It is absolutely magnificent! The brilliant, blue color of the lake is caused by the refraction of light off glacial rock flour deposited into the lake. The view of the mountains beyond the lake is the Valley of the Ten Peaks. It is also known as the “Twenty Dollar View” because it used to be pictured on the reverse side of a Canadian twenty dollar bill. There are several hiking trails around the lake, but the most popular one is the Rockpile Trail. The trail itself is short and you will only gain elevation of about 80 feet as you work your way to the top of the giant rock pile (as the trail is so appropriately named) overlooking the lake. 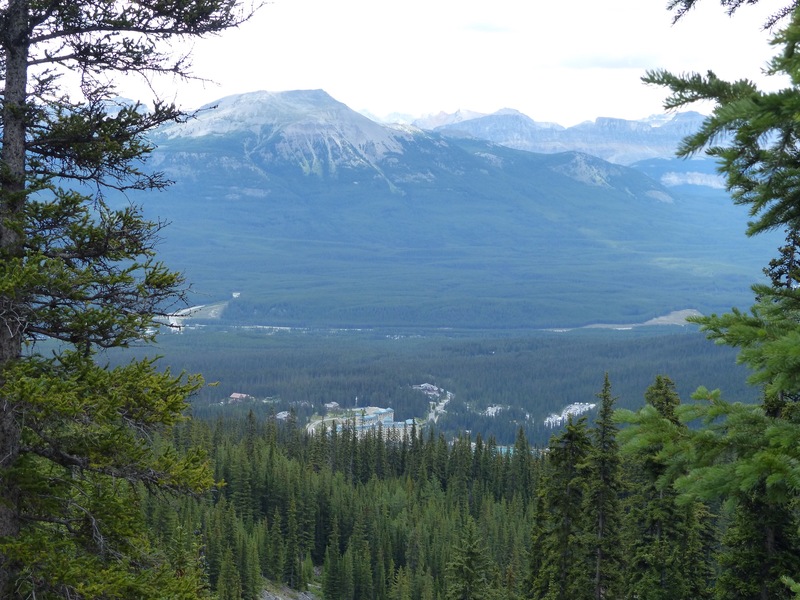 The view from the top of the rock pile (pictured above) is one of the most photographed sites in all of Canada. After the Rockpile Trail, we walked along the Shoreline Trail. 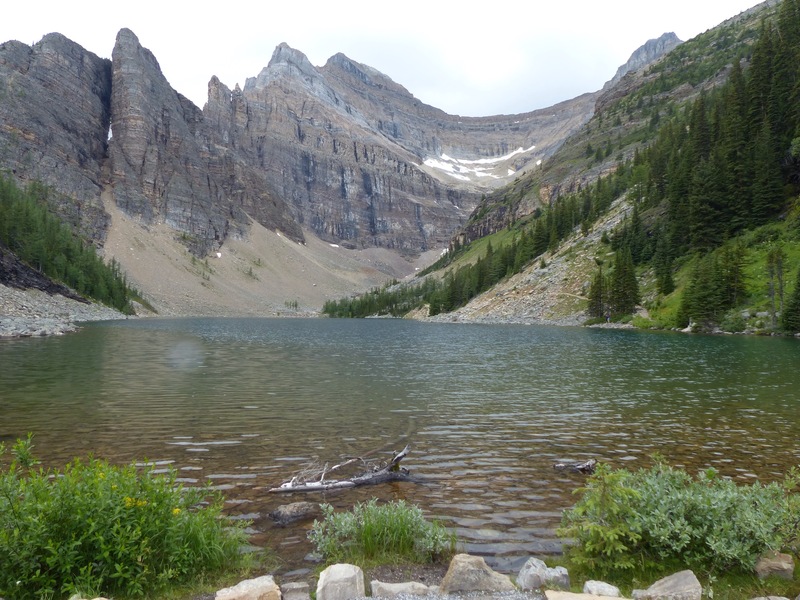 This leisurely trail is on flat ground and is a great way to see more of the lake as well as the Ten Peaks. 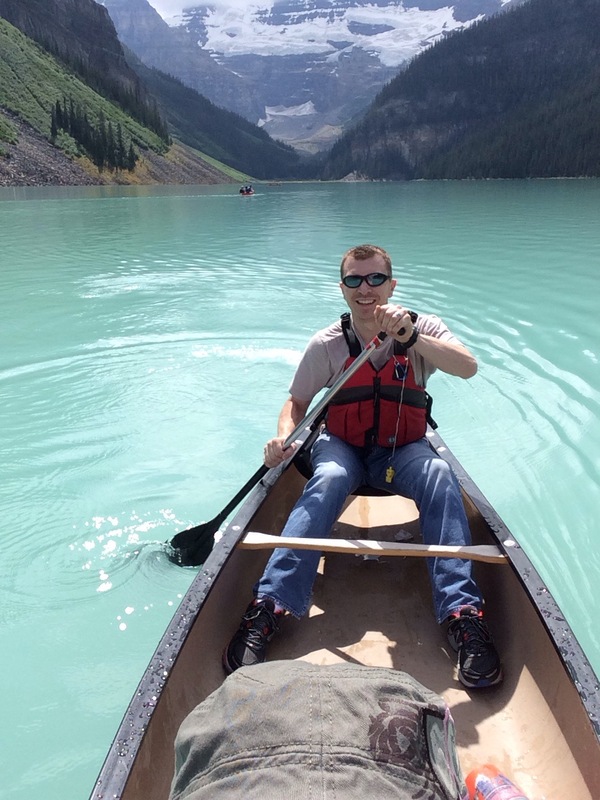 You can also rent canoes at Moraine Lake and the rates are slightly cheaper than at Lake Louise. Not only will you save some cash, but you will likely avoid the crowds as well. The picture below shows the rock pile that we hiked to the top of. Posted on July 21, 2015 by Dayna B. 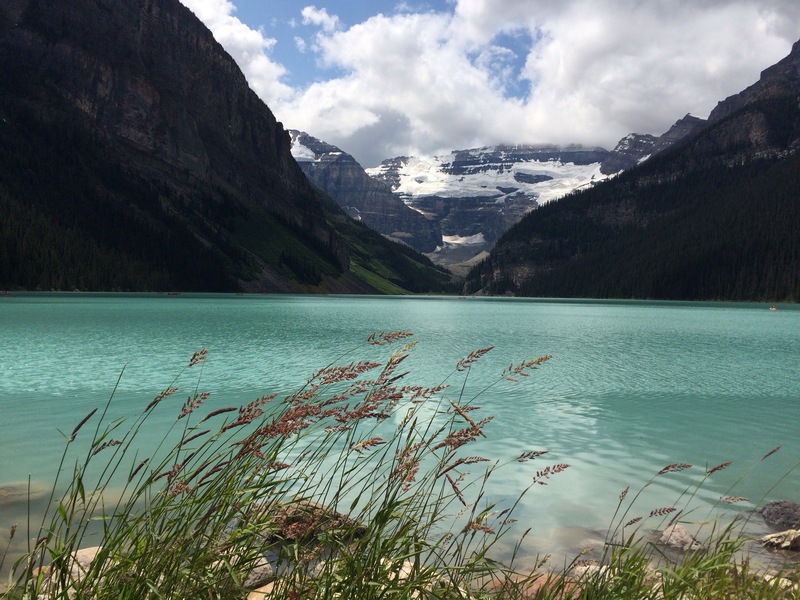 Lake Louise is well-known for two alpine tea houses; the Lake Agnes Tea House and the Plain of Six Glaciers Tea House. 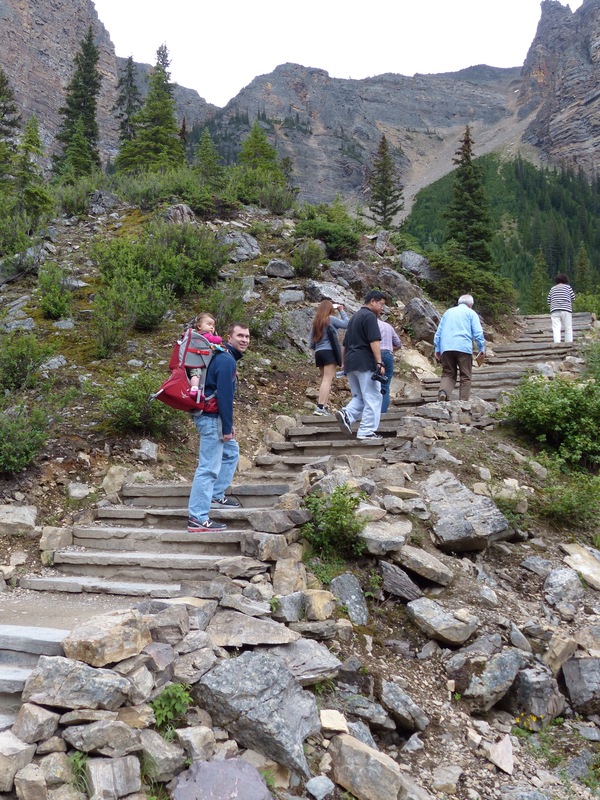 The hike to the Lake Agnes Tea House is one of the most famous trails in Banff National Park. 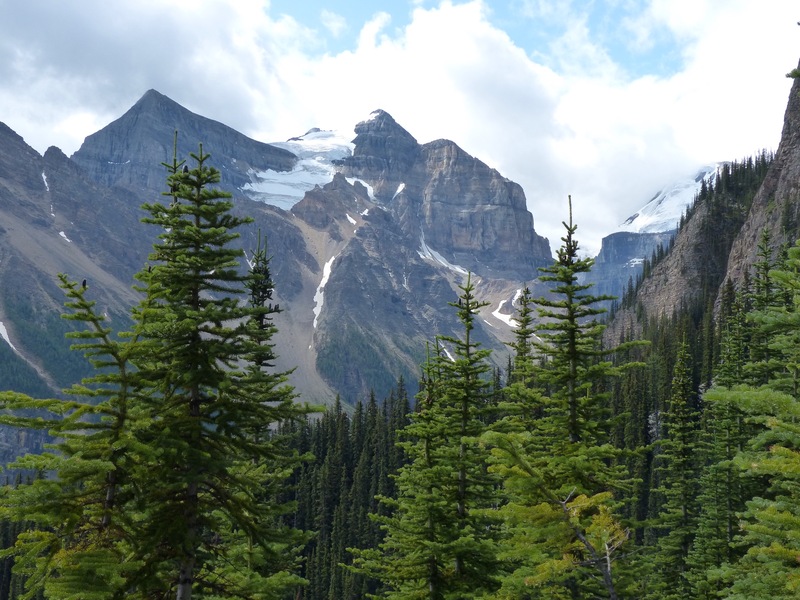 The 4.5 mile hike (roundtrip) begins at Lake Louise and winds uphill until you arrive at a beautiful log cabin hidden in the forest alongside Lake Agnes. The cabin was originally built in 1901 as a refuge for hikers. In 1905, they began serving tea and they have continued to serve visitors from around the world for more than 100 years! This family-run tea house is situated at an altitude of just over 7,000 feet. The trail was very easy to navigate, however the hike was moderately challenging due to the 1,300 foot elevation gain. But, it was well worth the effort because the views along the way were magnificent! 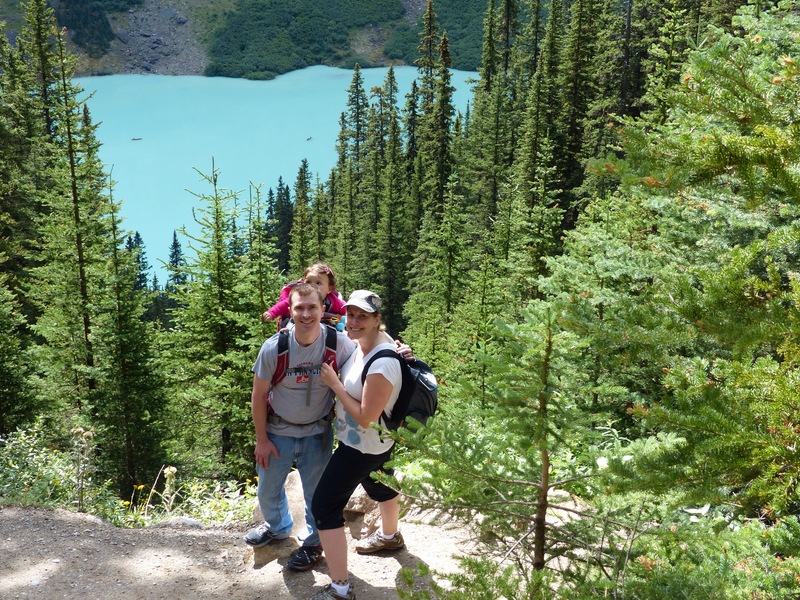 Part of the trail overlooks Lake Louise, which of course, is just as stunning from above. 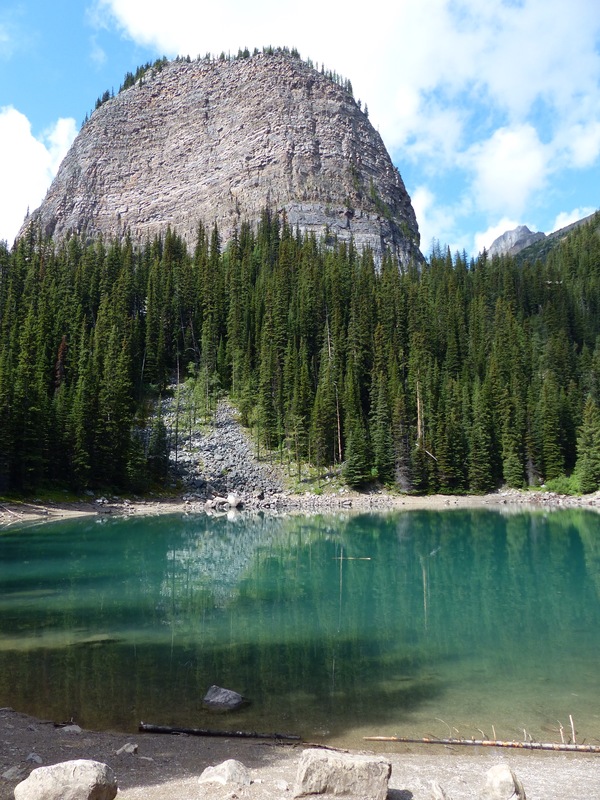 While hiking between each of the Lakes in the Clouds, you will also have fantastic views of the Canadian Rockies. 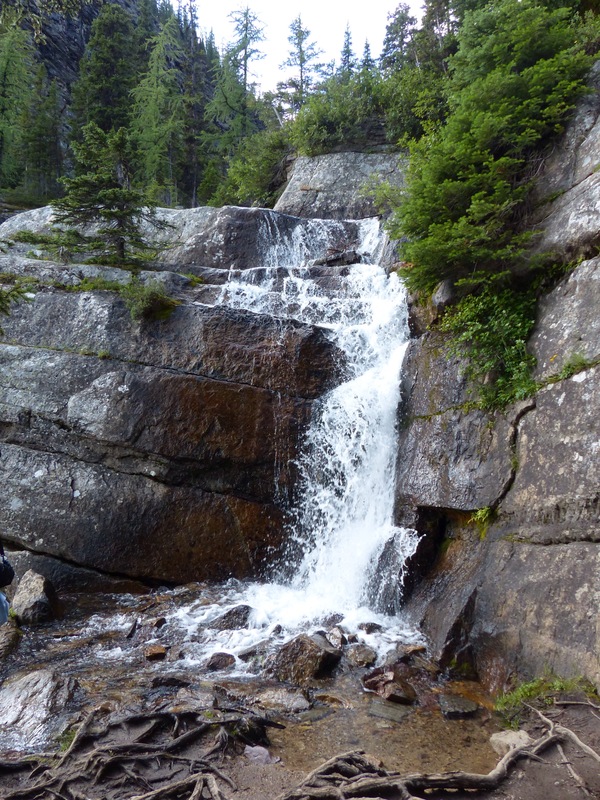 As you are nearing the tea house, you will see the waterfall that cascades from Lake Agnes. Once you reach this waterfall, you are nearly there! Just a few more steps to climb. By the time we reached the tea house, I was ready to indulge in a tasty treat. They offer a menu of fresh, homemade goods, all made on-site. Rob enjoyed a hearty bowl of soup coupled with their homemade oatmeal brown bread. I opted for the sweeter side and chose the apple crumble (a local favorite – rightfully so). And while at a tea house, of course we had to get some tea! They offer more than 100 varieties of loose leaf teas, which makes it difficult to choose. Being in Canada, we figured you can’t go wrong with anything maple, so we shared a small pot of the Maple Black Tea and it was delicious! 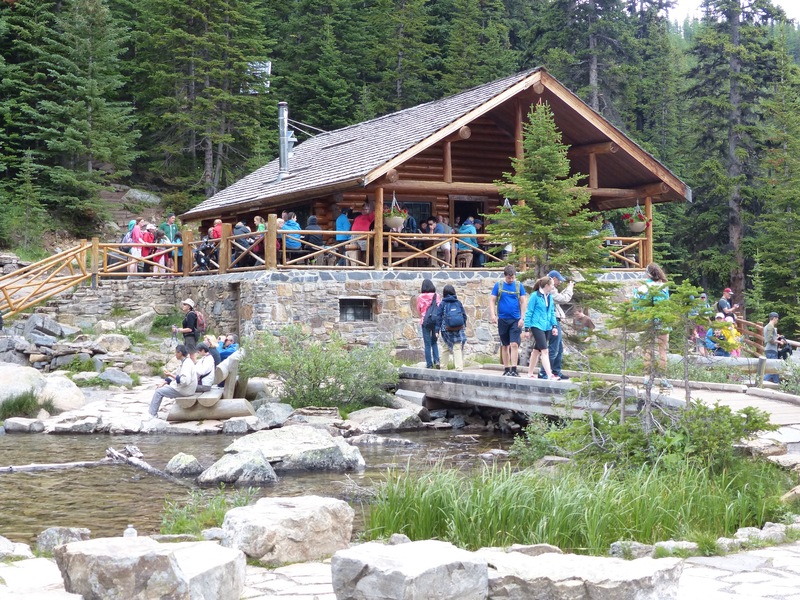 Note to visitors: The Lake Agnes Tea House only accepts cash (Canadian & American). It would be an awful shame to hike all that way only to realize at the top that you only have plastic! While there, enjoy the view down below of Lake Louise and the Fairmont Chateau. If you are feeling really adventurous, try the “Tea House Challenge” and visit both tea houses in one day. The Highline Trail connects both tea houses to form a 9 mile loop. Or if hiking just isn’t your thing, but you really want to see an alpine tea house, then you can make the trek on horseback. 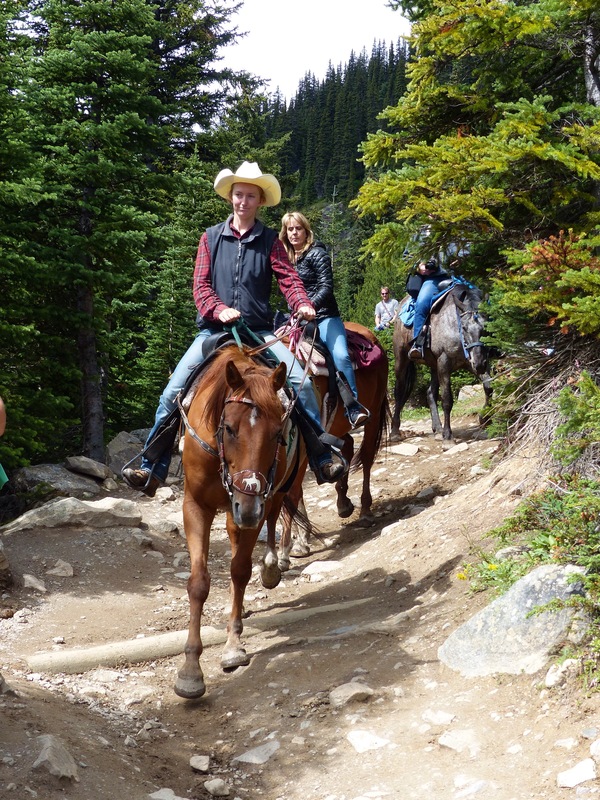 Note to visitors: There are horses on the trail, so watch your step! Posted on July 20, 2015 by Dayna B. 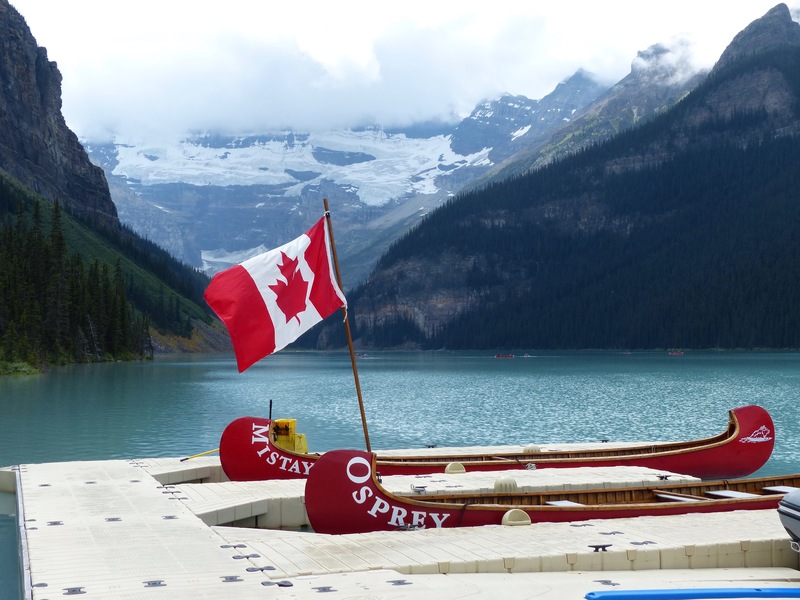 While in Banff National Park, a visit to Lake Louise cannot be missed. This majestic lake was named after Queen Victoria’s fourth daughter, and the mesmerizing turquoise water is the crowning jewel of the park. The scenic background of Lake Louise is comprised of the snow-capped mountains of Mount Temple, Mount Whyte and Mount Niblock of the Canadian Rockies. 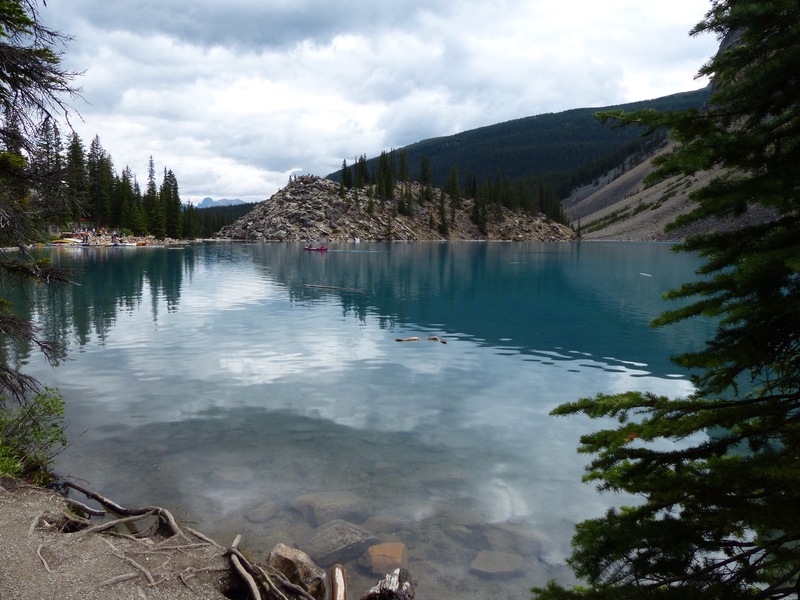 There are wonderful hiking trails around the lake, or you can pay to rent a canoe and coast across the turquoise water. 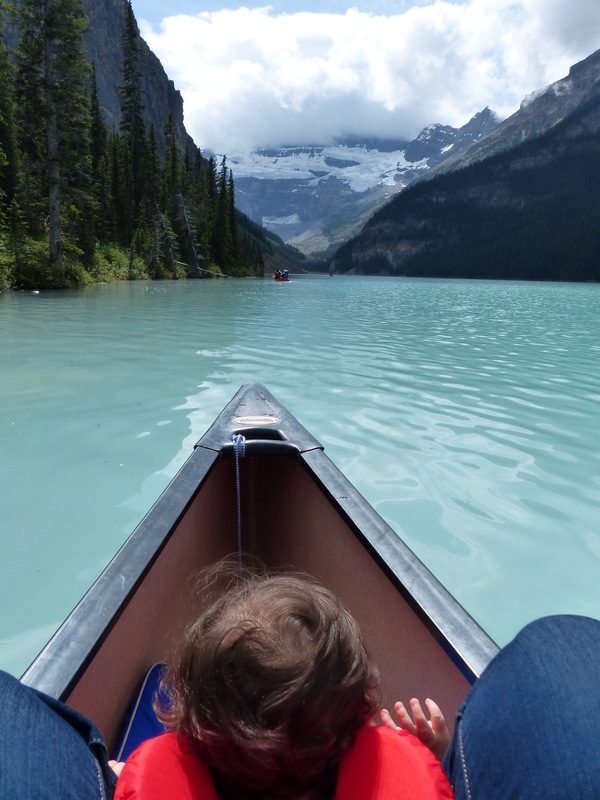 The canoe rentals weren’t cheap, but definitely worth it! A half hour rental cost 55 CAD and a full hour was just 10 CAD more. Clearly the full hour is the better deal, but we didn’t think Ella would sit still for that long so we opted for the 30 minute ride. I got to relax in the canoe, while Rob did all the hard work rowing. But, I did have the very important job of making sure Ella didn’t throw herself overboard! Ella did start getting antsy towards the end of our term, so opting for the shorter rental was definitely the right call. And I’m fairly certain that Rob was ready to stop rowing by that point anyway. As we arrived back at the dock, there was a photographer standing by to capture a group shot. Normally I don’t get suckered into buying these over-priced photos, but this time the magic of the lake made me do it. 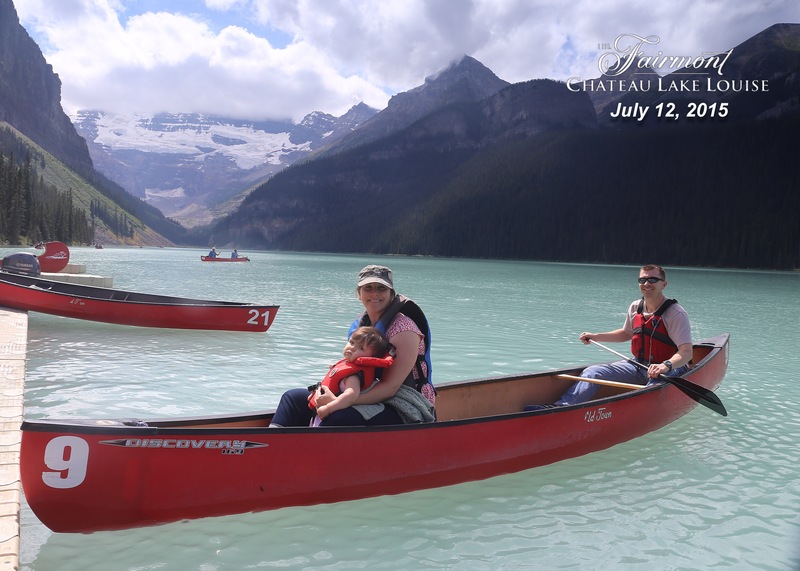 So we shelled out an additional 20 CAD so that we could keep the only available picture containing all 3 of us on this canoe. Where in the World Have I Been??? Posted on July 9, 2015 by Dayna B.
I don’t mean in the traveling sense (although I do need to catch you up on that). I am referring to my absence in the blogosphere! It has been almost 20 months since my last post. So where the heck have I been? 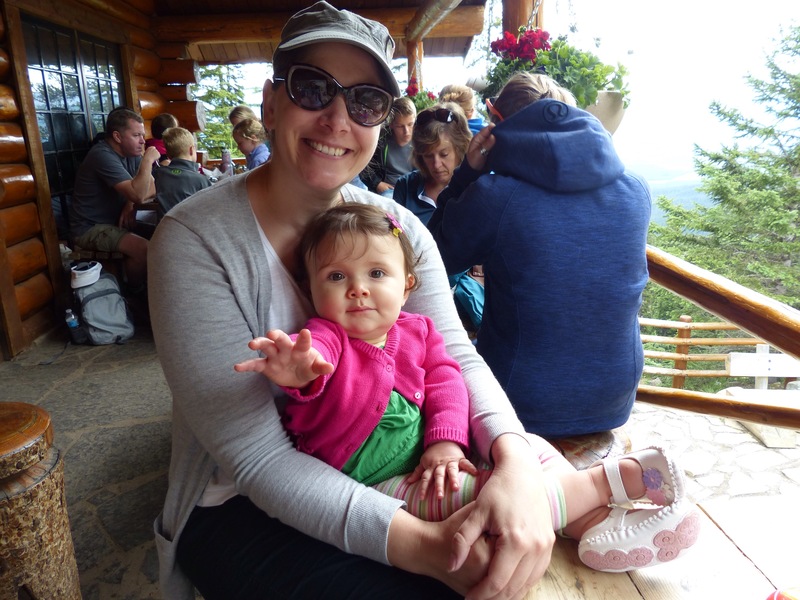 Well, I am excited to report that I have embarked on my greatest adventure yet…..MOTHERHOOD! My lack of blogging does not mean I have not been traveling. Let’s just say that becoming a parent was all–consuming for quite some time. From the moment I knew I was pregnant, all of my focus revolved around my baby and keeping her safe. I simply didn’t have the mental capacity to keep up with this blog. Maybe it was the hormones? I don’t think I am too off the mark in admitting pregnancy-brain probably wouldn’t have permitted me to write coherently anyway. (Pregnancy-brain is a real thing!) Needless to say, after our daughter was born things just got worse, as far as this blog was concerned. Pregnancy-brain promptly turned into Mommy-brain (also real) and no matter how much I wanted to keep this blog updated, I just couldn’t make it happen. But Ella is about to celebrate her first birthday and I am finally feeling like I might just be able to do this thing again. So bear with me while I try to learn how to blog again. Back to traveling – people always say that traveling is a dream instead of a reality once you have children. Clearly those people have never met me. I am determined to prove them wrong and continue my quest to see the world! And so far, I think it is safe to say that I am actually making it happen. 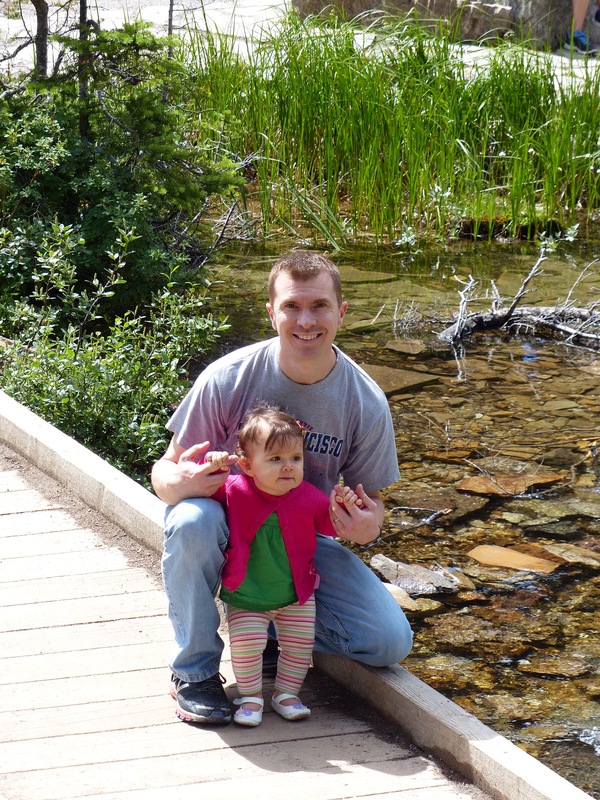 When Ella was just 2 months old we took a road trip to Bar Harbor, Maine to hike in Acadia National Park. 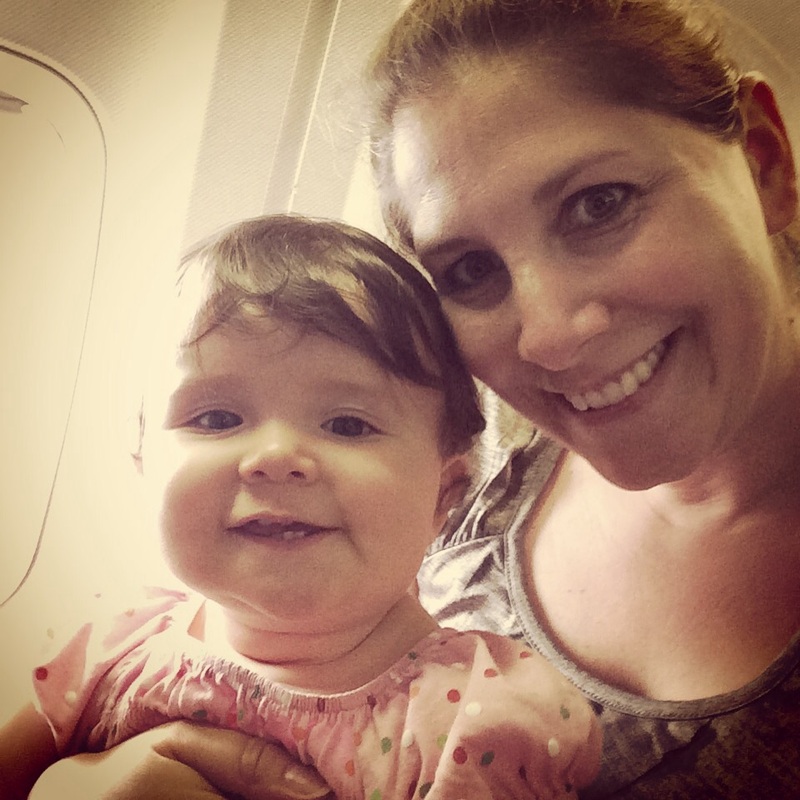 When Ella was 6 months old she took her first flight and she traveled like a champ! 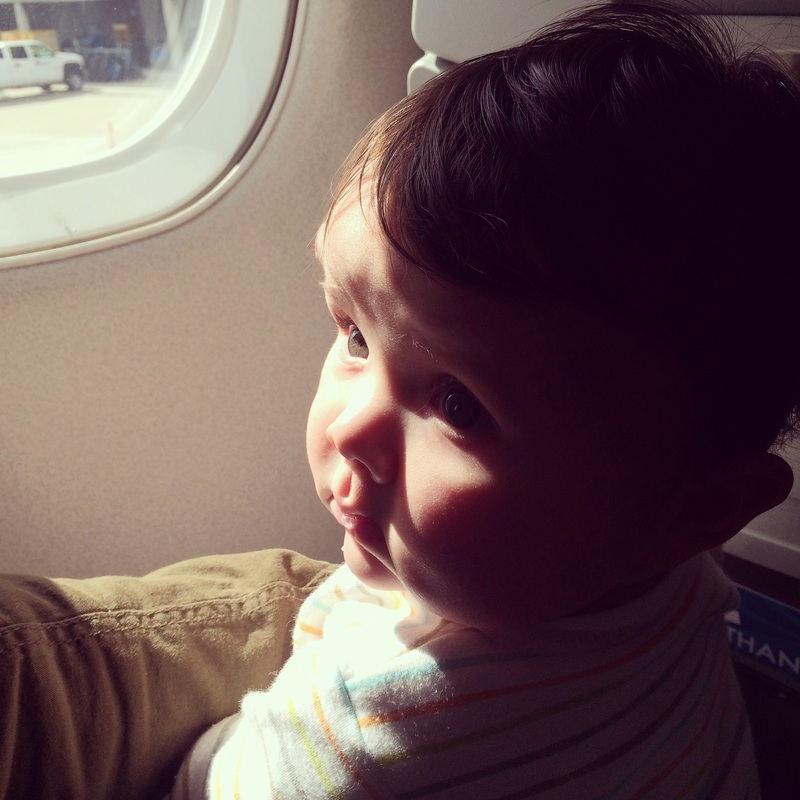 More recently, we traveled to Chicago and I was even brave enough to fly one leg of that trip with an infant, by myself. This summer we have lots of travel plans on the books. 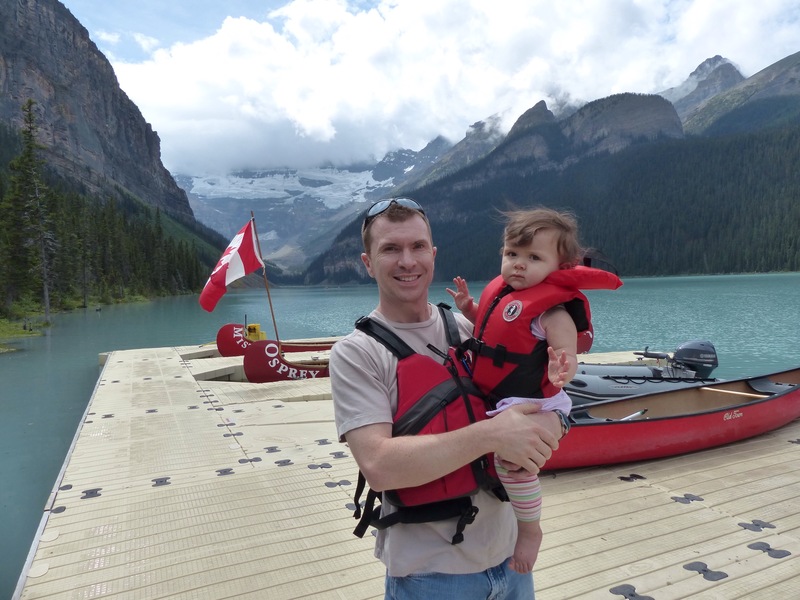 In just a couple of days Ella will get her first passport stamp when we fly to Canada to go hiking in Banff National Park. Later in July, we are taking a road trip to Cape Cod, Massachusetts. Finally, in August we are going to Aruba. And we might actually be a bit crazy for this last one, but we are in the early planning stages for a trip to INDIA next winter! So stay tuned to hear about our upcoming travels and hopefully I will even get around to catching you up on these last couple of years. 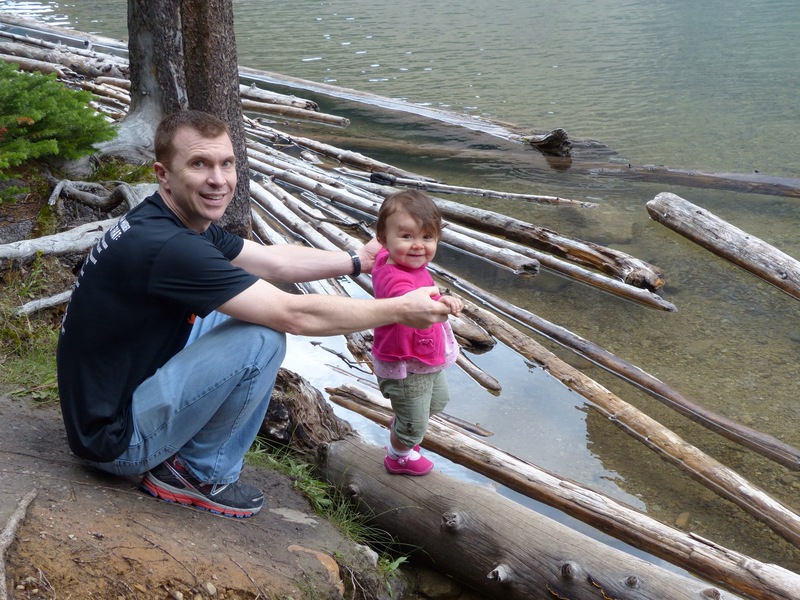 And maybe I can inspire others with children to travel too!